Donato Giancola, the renowned science fiction and fantasy illustrator that I wrote about previously last year and in 2005, has a new instructional DVD (more details here), published by Massive Black Media, in which the camera follows him through the creation of “The Mechanic” (larger version here), an painting that was created specifically for the demonstration. While you might expect a painting developed for an instructional DVD to be more quickly realized than Giancola’s highly finessed professional work, he turns in a work worthy of the 18 Chesley Awards he has garnered, showcasing his strengths not only as an imaginative science fiction artist, but as a strong figurative painter, steeped in the techniques of traditional oil painting. The demonstration goes from initial sketches to reference photography through the step by step creation of the finished painting. The two disc DVD is $60 and runs 5 hours, but there is a 6 minute+ trailer on YouTube, that is instructive in it’s own right, in addition to giving a good taste of the quality of the DVD. Giancola presents his thoughts with clarity, explaining his process in some detail, while the director alternates between time-lapse segments, in which some of the more extended periods of painting are condensed, and real-time segments in which the most salient parts of Giancola’s painting process are demonstrated. The 1900’s had N.C. Wyeth. 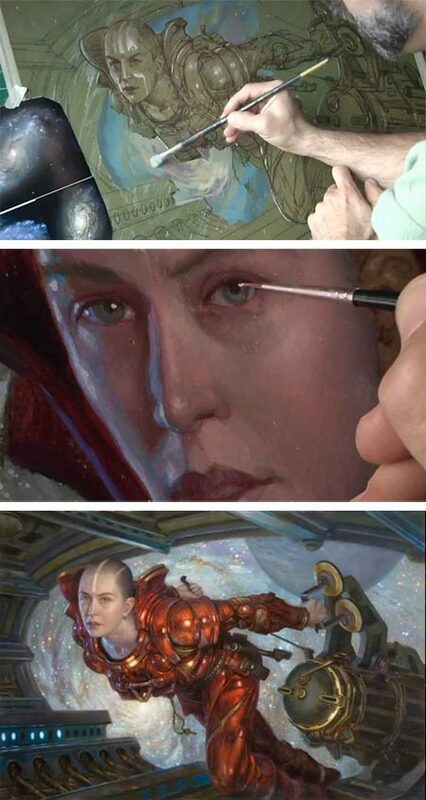 We have Donato Giancola. What great stories they tell in there paintings. Amazingly I found I hadn’t encountered this artist’s work before. I went onto his site and found much to admire. Ultimately I’m reminded not so much of other sci-fi illustrators as I am of the work of the great historical classicists like Paul Delaroche(especially in works by Donato like “Agincourt”).